i got you yellow, she doesn't want yellow, THE BISHOP! Paul: Here are two things that are absolutely and irrefutably true: 1) I love art. 2) I hate getting up early. Here are two more things that are painful in their truth: 1) Sometimes you have to get up early in the service of your art. 2) This feels awful. Here are three other things that feel awful: 1) When the guy at the market has nothing to sell but combinations of the same sickly yellow paint (“I’ve got a bit of yellow, some yellow, or lots of yellow.”) 2) Mixing colours that you can’t then use because someone beat you to the cathedral again. 3) When the bishop buggers off. Honestly, what is the point of bishops? 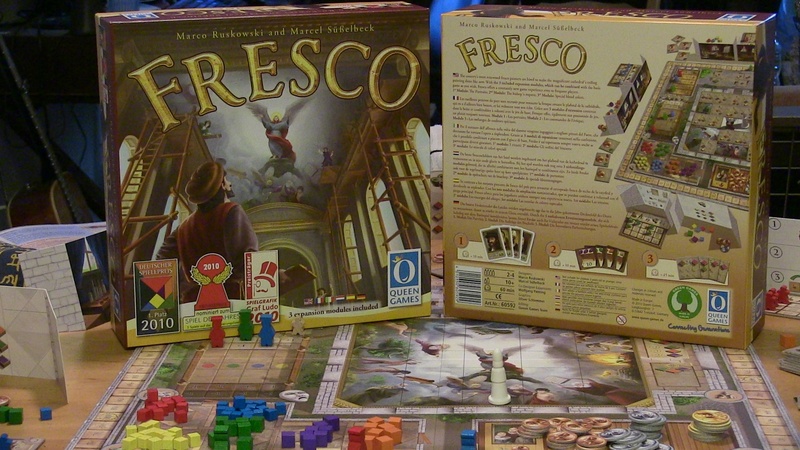 Here’s something that’s great: Fresco. 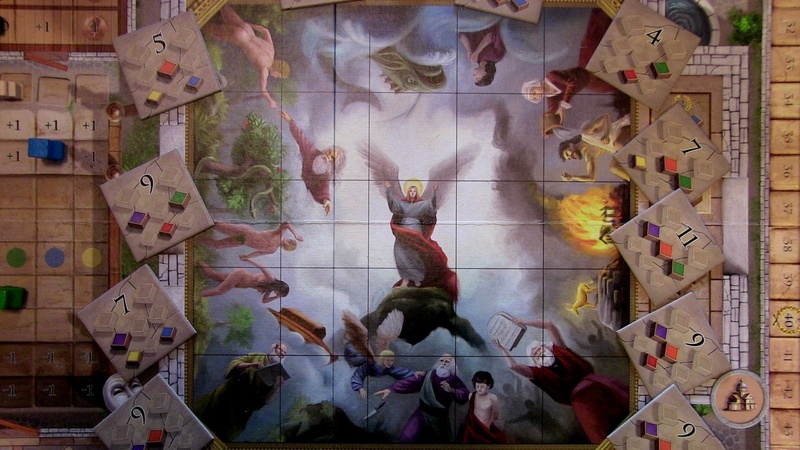 Splashed across the middle of Fresco’s board is a huge image, cut into a grid of five by five squares, that gives numerous nods toward famous Renaissance art. You know, things like God wiggling his finger at Adam, the expulsion from the Garden of Eden, or that portrait of an an angel flying in a sort of low-energy fashion that makes you think they’re on a Segway. Your very first task is to cover this up with twenty five tiles that represent sections of (who knew!) a fresco which you and your rival artists will gradually restore, section by section, until you’ve returned it to its former glory. And you’ll hate each other as you do this. Not initially, mind. 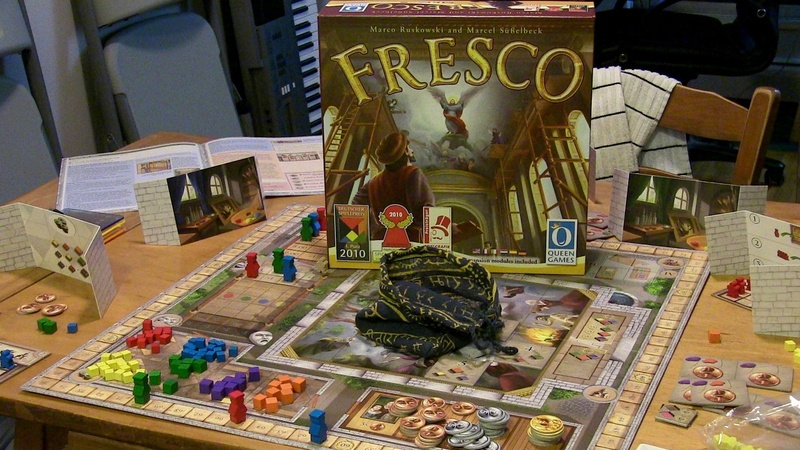 Initially, Fresco is a game of planning and pondering, of preparing a palette. By it’s conclusion, it’s a frantic scraping at stains as you desperately try to pull every last trace of pigment out from under your worn nails, hoping you mixed enough purple to put a twinkle in God’s eye, or have just enough blue to finish an angel’s bum. I guarantee that, by the end of any game, you’re going to be really, really mad at one particular primary colour. It begins thus: Each player decides first (and publicly) what time they are going to get their five apprentices out of bed, then second (and secretly) what tasks they must perform. These apprentices hide behind player screens, ready for placement on a board with multiple spots for shopping, restoration, painting, mixing and, uh, going to the theatre, the one single thing that makes sad artists happy again. Multiple spaces for each job means your apprentices can tackle tasks multiple times or spread their talents and tinctures in all directions, but those public spaces can’t be shared: Everyone wakes at a different time. Then, the screens fall like a veil from a portrait and everyone gasps things like “You’re going to mix how many colours today? You’re sending three people to market? Good luck with that.” The consequences then either begin to roll comfortably on from one another, like raindrops down a window, or they collapse together like poorly-arranged dominoes. Why? Well, let’s start with getting out of bed. Rising early makes for an angry artist, but the early easel catches the colour because the first thing everyone does is go to market for paints. A collection of tiles that show different amounts of primary and secondary colours are drawn randomly from a bag and distributed across market stalls. The earlier arrivals at market pick sooner, but also pay more for the privilege. Let’s say you rose first! You claim a market stall and buy as many tiles of paint as you allocated apprentices. 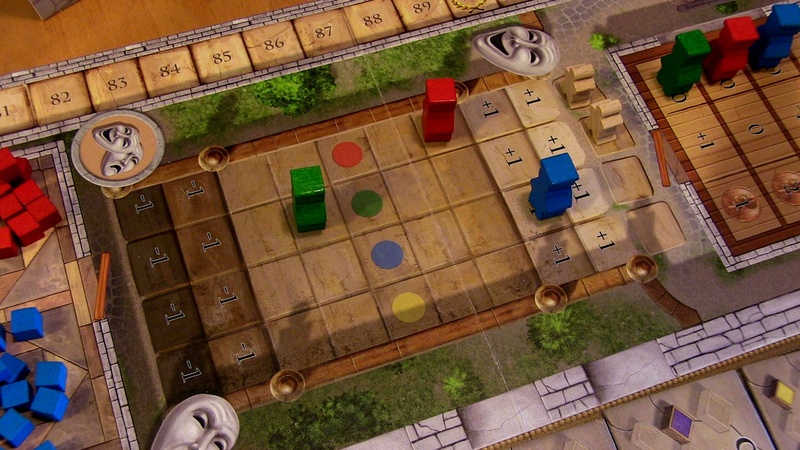 Perhaps that’s three, so you pay your coin and claim one tile of three yellows, one of red and blue and one of green. Green! 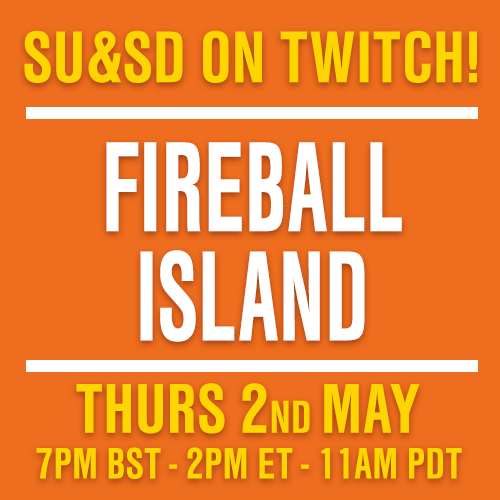 A secondary colour! Particularly important. 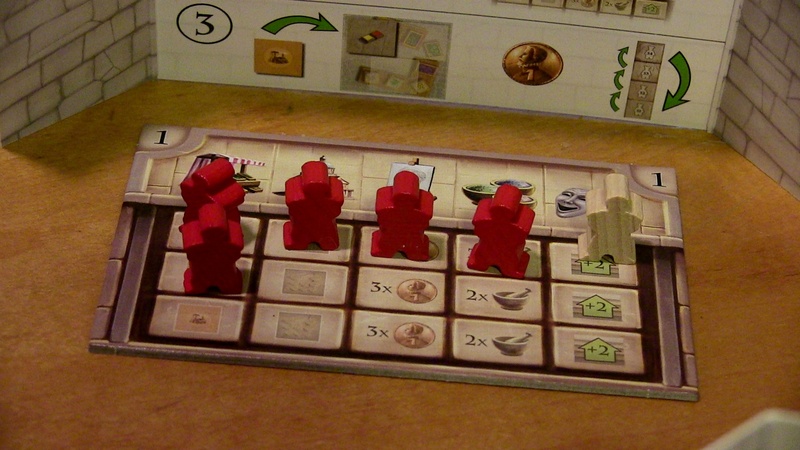 You cash in those tiles for cubes and squirrel those away behind… wait. Your other player screen? You have two?! Okay, that’s entirely unnecessary. Really, it is. You have enough room behind one for everything and, with a little discretion, can still hide resources while revealing apprentices. You also trash that market stall after. Even if there were tiles left, nobody else can claim them. Cruel. Wasteful. Not that you care. 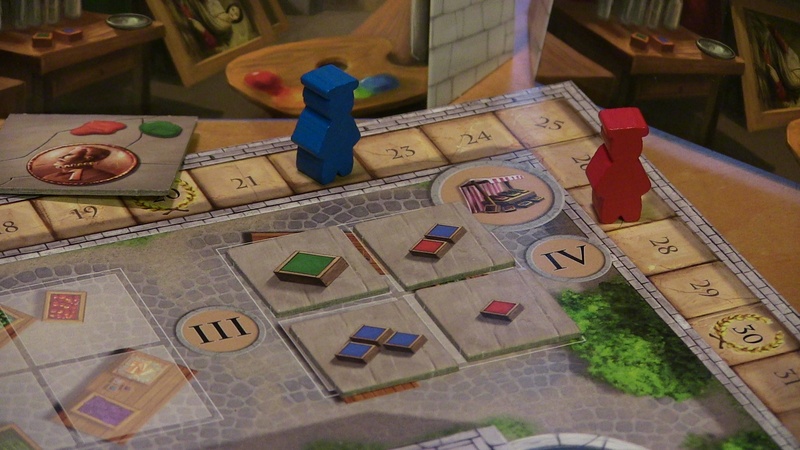 You’re dashing ahead to the next task, touching up that fresco by cashing out cubes that correspond to tile to win that tile’s value in victory points, perhaps even several tiles if you sent out several apprentices. Then it’s off to your private studio to earn money, with apprentices placed here generating funds, before you then get all alchemical, mixing any primary colours you have left to make secondaries. Finally, any apprentices you’ve told to go to the theatre bump up your overall mood which, by the way, you took a hit on at the start of the round when you rolled off your mattress. Keep the mood high and you win a bonus apprentice, an extra person you can deploy, but burn everyone out and you start to lose staff to fatigue and sadness (though it’s rare you’ll suffer too much). If you’ve completed any sections of the fresco so far, these earn you a little extra cash. Then, things begin anew. What I hope is happening right now is that all of Fresco’s weird temporal considerations are suddenly starting to burst into life in your brain. Yep, yep, you’re right! You do need to think about what colours you’ll use now, which you’ll mix down, which fresco tiles you can try to claim quickly and which you should wisely save for. 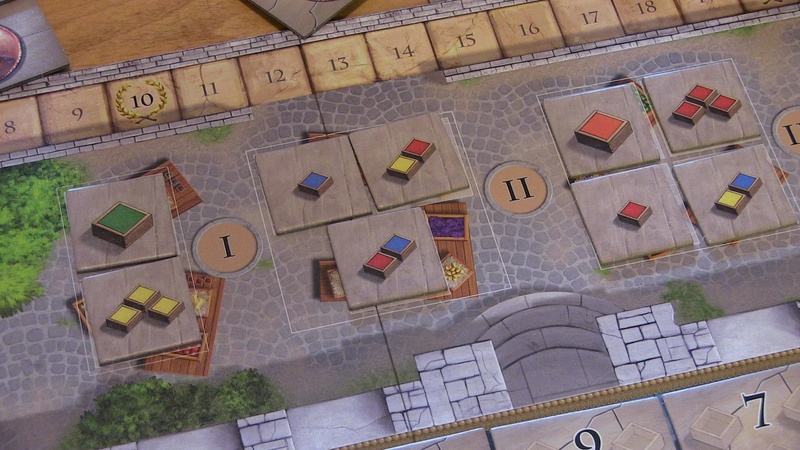 Players after the first are also working out how much they’re going to spend at an always random market before even knowing which stalls will be left open. There’s little that’s ever certain and a lot of hedging your bets, of building up rainbow pigment banks to cover multiple possibilities. Those of you who are familiar with them might now be thinking of worker placement games, European-style games where you plop people onto spaces to claim actions or resources first because you do not like to share. This isn’t quite Fresco, though. 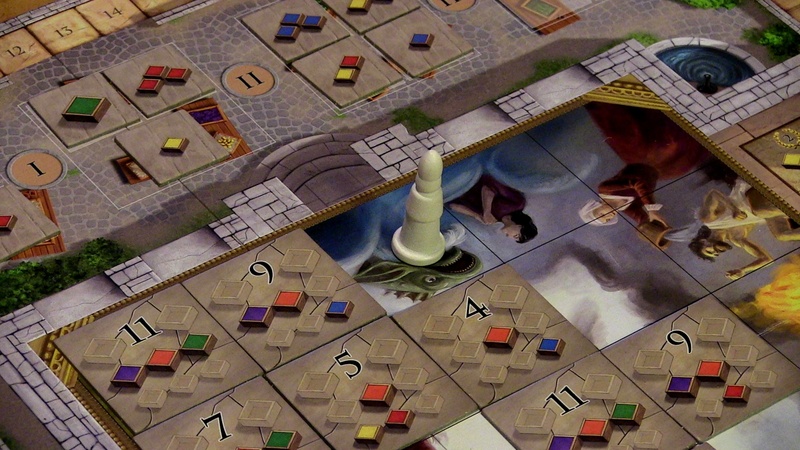 Fresco is a game of theft. You only really compete to place workers on waking times, having free roam of your own action boards, but otherwise you’re stealing opportunities away. Stealing paint. Stealing fresco tiles. Steal, steal, steal. And, oh boy, you can really have some very, very bad turns if you put a foot wrong. Turns where you didn’t earn enough money in your studio and now can’t afford to get up early and pay for premium paints, or turns where you had a lie in to cheer everyone up, but came home with only blue and now can’t restore anything blue or mix anything with blue but oh yes definitely you have blue you sure have blue you have all the blue ever can you trade colours in this game nope enjoy your blue I am going to the theatre goodnight try not to feel blue. And I like it. A lot. Not least because all of the elements in its svelte, straightforward, eight page rulebook are not just simple but also relatable. 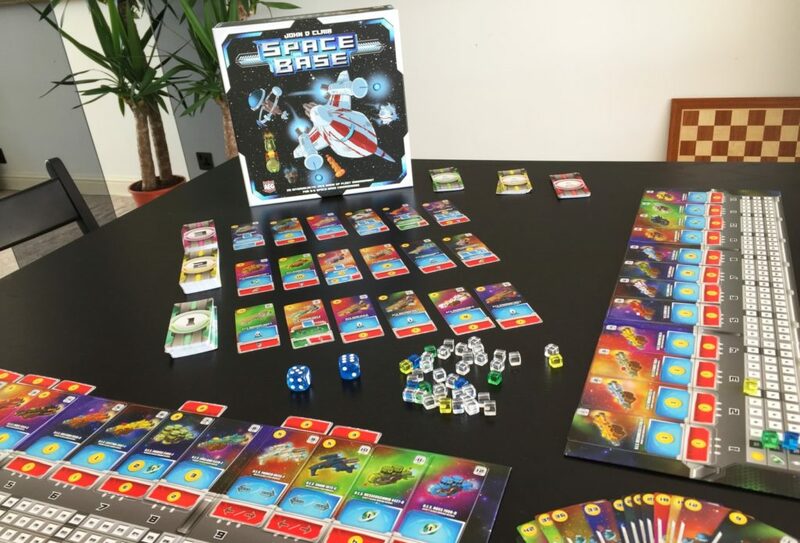 Teaching this game, I wasn’t explaining abstract concepts and currencies, as I feel like I am with many euros, I was talking about tired eyes and pots of paint. The complications introduced themselves rudely enough that I could just watch them happen and beam. And while you can both deliberately and also very, very accidentally screw over other players, hard lessons are learned quickly and everyone can spread their apprentices as if spreading bets, still going heavy on one or two things when they feel confident. 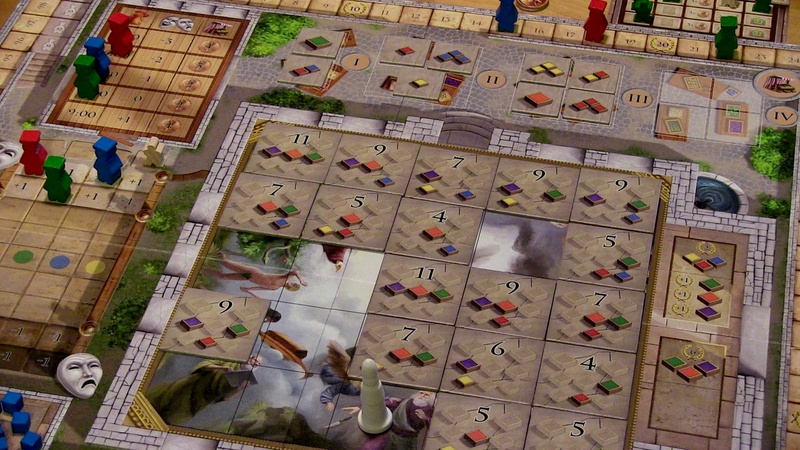 Fresco is challenging, but it’s not cruel. It also has its little forgivings. If you have a bunch of paint to hand but can’t restore the fresco, you can always splash it across the altar instead, earning a few points to keep you in the running. When you land on the same victory point square you choose to step a space ahead, for the score advantage, or behind, for a turn order advantage. Then there’s the bishop, a weird man who walks about the fresco, apparently following a trail of coins that people have dropped. Every time someone goes to score a tile they can pay a coin to move him a space. Move him next to or onto a tile you’re scoring and, after following that cash, he suddenly looks up at your work and beams. Well done! You score extra. Or you can just be a jerk and move him away from sections you think other people will score, nudging him into the corner with your pennies. Suddenly, it’s over, a four player game done in ninety minutes or even an hour. When most of the fresco is revealed the final turn becomes a special rush round where you can restore twice and not give a damn about tiredness. 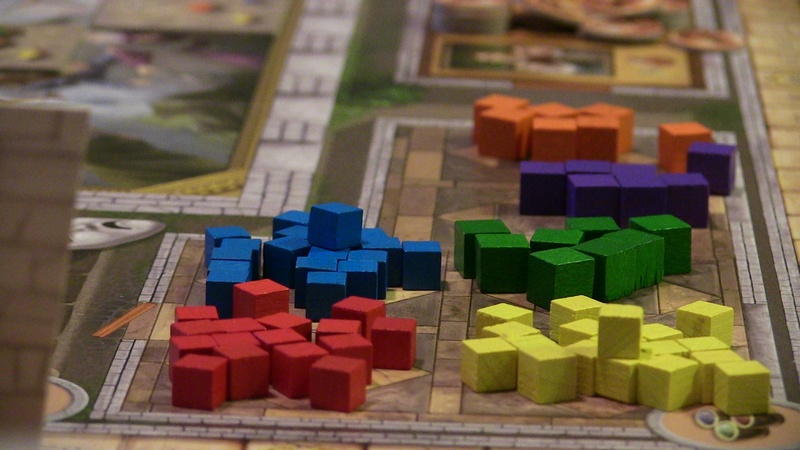 After initially starting with little paint and having to be a wise spender and industrious earner, games tend to close with different priorities. You’re frantically trying to use a few secondary colours to score just one more tile, sitting on a growing pile of money that you don’t need any more because money does not simply buy you the specific colours you need for that last tile you have any a chance to score ugh (though it does at least grant some victory points). 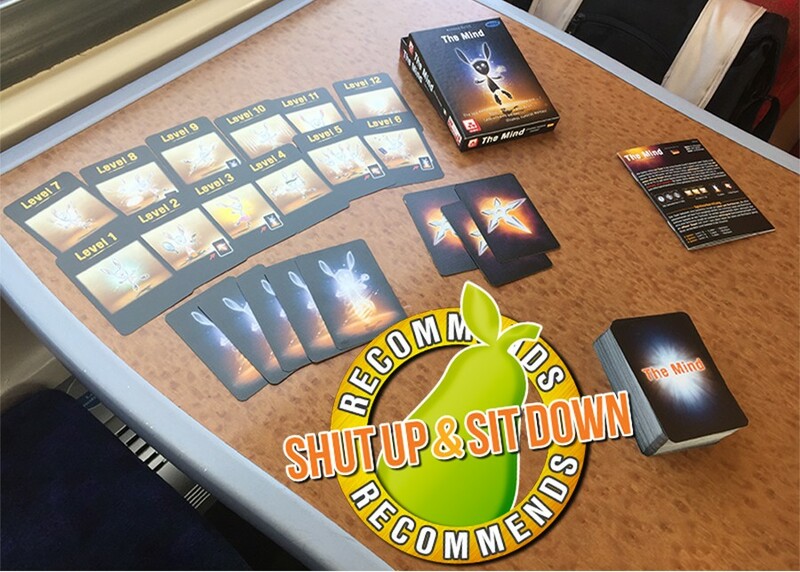 Without a doubt, there are going to be many people out there who want something that plays slower, longer and more ponderously, and for you folk Fresco is going to feel like eating toast for dinner, but writing this review makes me desperately want to play it again and I’m sure I can score a little better this time. 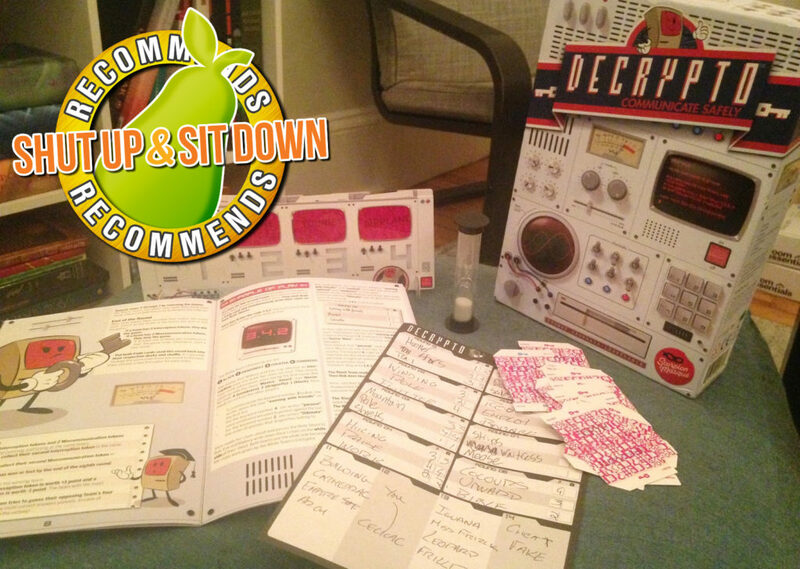 Shut Up & Sit Down recommends Fresco with the subtle smile of a Mona Lisa. It’s a work of art and, like art itself, I wish I’d got into it sooner.